The next time U.S. soldiers snap a picture of your eye or scan your face, they’re likely to store all that personal, physical data in the cloud. The Army’s Intelligence command recently awarded a sole-source contract to bring the classified Defense Cross-Domain Analytical Capability, a database storing various kinds of security-relevant information the Army collects, onto the proverbial “cloud” of distributed servers and networks. Among the focuses of the project: “integrating Biometrics into the cloud,” according to a description of the contract. The effort “involves the Entity management and tracking system for Biometrics/Human Terrain Facial recognition capability (photos, video) and edge-to-Cloud Enterprise Messaging (Corps/Division Node to/from Handheld,” says the Army Intelligence and Security Command. “Human Terrain” refers to an Army program in Iraq and Afghanistan that sought to map unfamiliar tribal networks and other social structures. Integrating that into an intelligence database is a major shift, but more on that in a second. 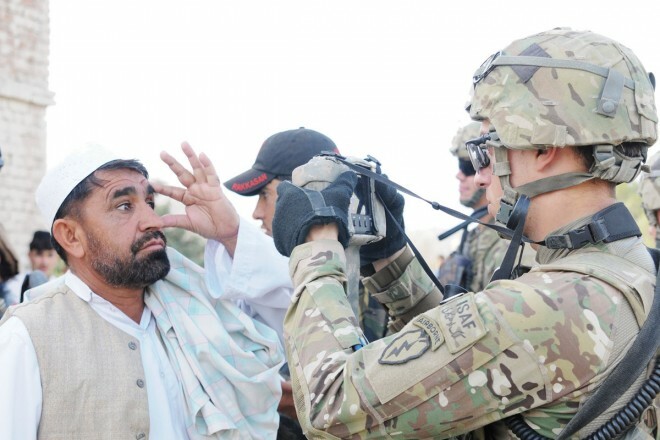 Currently, at least some biometric data is stored locally in the warzone of Afghanistan, in or around where soldiers and marines on patrol take it from locals and insurgents. That limits troops’ ability to exploit it, particularly when they’re mobile: troops who detain a suspicious person in, say, Djibouti won’t necessarily know if he’s already been nabbed in Iraq or Afghanistan or elsewhere. And supporting mobile operations is key to the whole cloud-storage project. “Mobile support in Cloud Corps Nodes includes provisioning the handhelds as data receivers and summarization of query results for handheld,” the Army command envisions. Still, the military is into biometrics in a big way. It’s created and maintained biometrics databases containing literally millions of iris and fingerprint scans from Iraqis and Afghans. The Iraq database has outlasted the Iraq war: it resides permanently at U.S. Central Command in Tampa. Evidently unsatisfied with the clunky ViewFinder-esque mobile tools for collecting biometric data in the field, in February the Pentagon inked a $3 million research deal with California’s AOptix to check out its smartphone-based biometric identifier, built on an iPhone and iOS. Then there’s all the Pentagon’s additional research into identifying people by the unique pungencies of their body odor and the ways they walk. Whatever McFate and Fondacaro’s intentions, folding biometric data from the Human Terrain System into an intelligence database collapses their distinction. Once that information enters the database, nothing stops analysts from marshaling it for potentially lethal military operations. That will have implications if the Army ever again tries to get into the social science business. The obvious worry for any effort like this, aside from bandwidth, is going to be data security. Military cloud storage is still in its infancy — in 2009, the colonel in charge of the Defense Cross-domain Analytical Capability cautioned, “To a certain degree it’s cloud technology, but we are applying something that’s less bleeding-edge” — and many in uniform fear that they can’t adequately secure a cloud-based infrastructure. It’s a real concern in an age when Chinese cyber-espionage of U.S. military secrets runs deep. The unique physical characteristics of millions of people isn’t something you want to leave vulnerable. Still, if the military can figure out how to lock down its cloud, the Army looks likely to start storing some of its most sensitive and difficult-to-replicate physical data onto it. The 12-month project kicks off in late August — giving the Army plenty of time to collect more facial, eye and fingerprint information before upload.